Melker Ulvön is produced in two sizes Low Volume LV for paddlers between 50-85 kg and High Volume HV for persons between 75-110 kg. Melker Ulvön HV is longer, wider and has more luggage space. The kayaks are equipped with rudder and skeg and you can get them in orange, turquoise and white. The extended waterline gives Melker Ulvön an excellent glide and the highest speed with very little effort. With the large volume in bow, the kayak offers an exceptional performance catching bigger waves and swells. 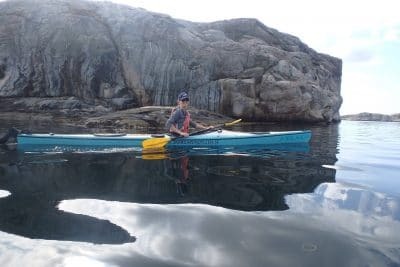 The kayak’s playfulness shows itself in the strongly turned freeboards and refined curves, which gives the kayak a great end stability and maneuverability, offering responsive and comfortable carving turns. The maneuverability can be even further enhanced with a responsive and retractable rudder (option) making it possible to master the most challenging conditions. The fitted cockpit is optimized for powerful strokes and is further customized for excellent comfort and great convenience during entry and exit, even for larger paddlers. The adjustable ergonomic and padded seat in combination with optimal legroom and padded thigh braces, gives you great control in toughest conditions and exceptional comfort during the day’s ride. Two big oval hatches in the aft and bow makes it easy to pack all the needed gear and offer great space for longer expeditions. The big 20 cm hatch is placed directly behind the cockpit, where the paddler can easily access the packed lunch, a camera or an extra jacket. The smart recessed area on the fore deck, just in front of the cockpit, holds the water bottle or the bilge pump in place. The kayak is designed by award winning design engineer Magnus de Brito, working closely with Melker Kayak design team. With Melker Ulvön we take yet another step towards fulfilling Melker Kayaks’ vision of producing kayaks with zero environmental impact.